José María stopped short of that, although he did confess to "believing." Can the European Team really duplicate the 10-6 comeback of the 1999 US Team, but do it on foreign soil? I'm not sure. For every Ian Poulter there's a Keegan Bradley, albeit with less experience. And experience is the real wildcard here. While Bradley hasn't played Ryder Cup singles before, I disagree with a lot of people about the chances of the US Team's "Bradleys" (if I may use his name as a generic term for the rookies) pulling this off. And I think my reasons may have an impact on your own game, so let me explain them. Here's the whole crux of the question: Is experience a transferable skill? In case you've never heard the term, let me explain it. A "transferable skill" is a skill you learn in one discipline that you can easily adapt to a new discipline. For example, the skills required to run a household with several kids -- coordinating schedules, balancing expenses, and all those other routine tasks -- are very similar to the skills used by efficient managers in a corporation. Part of the reason women became a larger part of the executive workforce starting back in the 1980s is that some smart businesspeople realized this. They saw that, if they brought these women in and showed them how to relate the tasks from one environment to the other, many of them rapidly brought a new level of practical organization to the positions. To listen to many of the pros talk on TV, you'd think that the only way you can learn to deal with pressure is to be a world-class golfer. Au contraire, mon frère! Have you ever dealt with a tough and maybe unexpected situation -- say, a car wreck or a family member who suddenly took sick? Most of us have faced some kind of pressure situation that we weren't prepared for, and we had to find a way to cope. Some of those situations (especially if they involved sick relatives) placed us under serious pressure for a prolonged period of time. Excuse me, but don't you think a golf match is far less pressure than that? The worst that's going to happen is that you lose the match. If you think that's more pressure than, say, a life-threatening illness, you have bigger problems than you'll find on a golf course! I say that if you can handle the pressures of everyday life, you can figure out how to handle a golf match. So do I have a feeling? Yeah -- I feel that the rookies on both teams will do just fine today. The bigger question is whether the "veterans" can keep their own perspective in place. The young guys (on both sides) aren't particularly worried about what people will say about them. And -- in your own game -- you'll find you handle golf pressure a lot better if you don't care whether you win or lose. It's just a game, after all... even if you're in Chicago and it's the Ryder Cup. Friday was a really good day for the US and not so good for the Euros. In many ways, that's not surprising -- after all, as I have said repeatedly, the home team (whoever they may be) should be favored in any Ryder Cup. But the results were a surprise for an unexpected reason. Traditionally, the US is strongest in foursomes (alternate shot) and the Euros are strongest in fourballs. Friday the Euros managed to tie the foursomes and the US dominated the fourballs. Save for Colsaerts and his record-setting performance, this Cup might be nearly over before it even got started. Clearly the rookies on both sides have decided that experience is overrated... and proven they're right! Much has been made of Woods and Stricker sitting, but I think that should have been expected. Between knees and necks, both men have been recovering this year and sitting them for their least-profitable format makes sense. Likewise, many questioned the Euro decision to sit Poulter, Donald, and Garcia on Friday afternoon, but I thought that also made sense. They played during the foursomes -- typically the worst Euro format -- and sat during the fourballs, when the Euros expected to be stronger and thus you would miss them least. Since you expect the strongest players to play both sessions Saturday and the Sunday singles, sitting them then made the most sense. It just didn't work out as planned, while the US team got more than they expected. As they say, that's why we actually play the matches. As for the question I began this post with... I don't think so, at least if Phil & Keegan win their morning match. I understand that Phil's arthritis could be a concern going 5 matches, but that assumes you're worried about his singles match. Phil's only 4-4-0 in singles; if he and Keegan can get me 4 points in the team sessions, I don't worry about his singles match. And if he goes 4-0 in team matches, he may be so thrilled that he blows his singles opponent away. So if they look good, I play that team in every session. I know everybody thinks DL3 won't play anybody for 5 matches, but that's not what he said. He said he'd prefer not to... that's a different matter. I also look for Simpson-Watson to play both sessions today, and for Kuchar-DJohnson and Woods-Stricker to play this afternoon -- the same groupings that played so well Friday afternoon. Let's not forget, fourballs have traditionally been the US weak spot. If it ain't broke, don't fix it. Overall, I won't be surprised it the day finishes 9-7 in the US's favor -- an even split of Saturday's matches. I look for the US to win the morning session and the Euros to win the afternoon session, the result we expected Friday. Oh, and one other thing... let's not forget that the US needs 14.5 points to win the Cup, while Europe needs only 14 to retain it. That effectively puts the Euros only 1.5 points behind. That half-point could be big come Sunday afternoon. Well, the professional referees are finally back on the field for the NFL... and the professional golfers are finally on the course for the Ryder Cup. We're in a really good spot right now. In the past, if teams had 6 or 7 good players, they felt they were lucky. The good players needed to play all 5 matches to give their side the best chance to win. Now we find ourselves looking at teams that are easily 12 deep -- the only exception being if a player gets injured or a virus after making the team -- and the only real problem is who will have to sit. And as I've said before, I think the home team always has the advantage -- not just because they can set up the course (that's less of an advantage these days, at least for the US team) and because they have the home crowd. I'm not questioning the strength of the US team. It's just that when you look at the names... well, the star power certainly seems to be on the Euro side. This is simply a matter of experience, of course; the big names on the Euro side are younger than the US stars. And the US has 4 rookies -- 3 playing the morning session -- while the Euros have one and he's sitting this session. The rookies playing this morning have a major, a FedExCup title, and 5 PGA Tour wins just during this calendar year. But still... it's going to take some time before Snedeker or Bradley strikes the same fear into competitors as McIlroy or McDowell! Welcome to golf's new generation. I can't wait to see if we have some new "big dogs" come Sunday night. And remember that the Ryder Cup is being carried by ESPN today. Rory uses a one-piece takeaway to swing the club back. Look, I know I beat this one to death, but since it shows up in the swing of virtually every successful player on every Tour, shouldn't that tell you something? Rory's head and spine stay centered all the way back and all the way through. This is made easier because his hands only go about shoulder high on the backswing. Remember, this isn't a power swing, so the swing can be shorter. Also, Rory's upper arms maintain contact with his chest all the way through the swing EXCEPT his trailing arm separates a bit at the top of the backswing (if your elbow bends and you swing to shoulder height, yours will too, then it drops back into position on the way down) AND his lead arm separates at the end of the finish when his lead elbow bends. You can keep those upper arms connected all the way through, but you'll flatten your swing so much that it won't work well out of the rough. Finally, Rory stays balanced all the way through from start to finish. It's a full motion, but not a fast one. Make it rhythmic and you'll find it easier to stay balanced as well. Pitching is more than just an important part of the game. It's also a good way to practice your fundamentals so your full swing is easier to make. For those of you who missed that special The War on the Shore (which was pretty informative) it's going to be replayed at 11am ET on Thursday. Then the Ryder Cup Opening Ceremony will be shown at 5pm later that day. And for those of you who prefer some "regular" golf -- a normal stroke play tournament -- the Web.com event will be broadcast on GC starting at 3pm ET on Thursday as well. Don't forget that the Ryder Cup itself will be broadcast on ESPN, not GC. It starts Friday at 8am ET. Sneds addresses the ball with a good square setup. The main thing he does differently from other players is make a short quick stroke. For most players that's the kiss of death... but not for Sneds. Here's the main key -- at least, as best as I can tell: Because Sneds is a fast player anyway, he manages to make a smooth fluid motion DESPITE the quickness of it. Watch most players stab at putts and you'll see the club go back, stop for a moment, then jerk forward. There's none of that with Sneds! Given the speed of his stroke, it's a nice even tick-tock motion. Anything else would result in constantly pulled putts. Likewise, most players would have trouble controlling their distance with a stroke this quick. Sneds controls his distance very well. I don't know if that comes naturally to him or whether he spends a lot of time practicing, but he's very successful with it. Because his stroke is so short, Sneds doesn't turn his shoulders much. The vast majority of movement in his stroke comes from the elbows and hands. Unlike many players, he doesn't twist his forearms when he putts. (Watch this short video several times and look at how solid all of these things are in his stroke. It's beautiful!) Together, those things mean he knows his putt is going to be on line as long as he keeps his rhythm and doesn't jerk the putter. All he has to think about is rhythm and distance. And that, my friends, results in a very dependable putting stroke. I wouldn't recommend putting with as quick a stroke as Sneds, but you won't go wrong by copying the rest of it! Louis Oosthuizen's been a topic of discussion this week -- there's a possibility that he could win the FedEx Cup without having won a PGA tournament this year -- and many of the commentators have struggled with his name. Of course, Louis isn't the only one whose name gives fans -- at least, English fans -- some trouble, so I thought I'd give you guys a little help. First, you need to understand that every human being is born with the ability to pronounce any sound used in any language. However, no matter which language we're raised to speak, that language only uses a small number of those possible sounds. The result is that we tend to get very good at those sounds and not so good at the others. That's also why children learn foreign languages more easily than adults; it's not that they're smarter somehow, but rather that the earlier you catch a human being, the easier it is for them to learn a greater number of sounds. Some people say "weat" and some people say "hweat". (I remember, when I was little, hearing some folks get into a similar argument over the word whale -- was it "wail" or "hwail"?) If you wanted to say wheat the second way -- with the h in front -- you can use the method my Korean instructors used. The easiest way is to break it into two sounds and say them quickly. So if you said the sounds huh and weat together, it would sound like huhweat, a single (but long) syllable; and if you said them really fast, you'd get hweat. It's the same idea with some of these foreign names. The key is using a compound sound made up of two simple sounds run together. That, as So Yeon Ryu told GC, is tricky for most English speakers, so she recommended just saying YOO. I believe I heard Ryuji give the same advice when asked about Ryo's name, so you would call them YOO-jee and YOH. I also seem to remember Ryo saying he was ok with REE-yoh, that he liked that name. But technically, you'll be much closer to getting Asian names right if you just pronounce ryu and ryo as YOO and YOH. Oost- is the one that trips up most people. Louis has tried to explain it as having a silent w, but most English speakers don't understand what he means. Instead of a single vowel sound, let's break it into two and run them together. Pronounce the Oo as "ooh" and, since the st sound now needs a vowel, put an i in front of it, like this: "ist". That gives us "ooh-ist". And just to make it a bit easier, we'll accent the last sound, like this: "ooh-IST". Say it slowly a few times, then start speeding up. As you get faster, it'll almost start to sound like there's a w in-between the two sounds. Really, it's not much different from the way you say his first name, Louis: LOO-ee. Same principle, but there we keep the sounds as two separate syllables. hui- is simple. In Afrikaans that ui combination is pronounced ay, so it's pronounced like the English word hay. And -zen sounds just like it looks: zen as in citizen. Put them all together and you get ooh-IST-hay-zen. See, it's not so difficult! Now you can impress all your friends with your mastery of foreign players' names. It's amazing how little useful footage of Jiyai Shin's swing there is out on YouTube. It's hard to find much recent footage. But I found these clips that should give you a pretty good overall feel for what she does. Note that she doesn't jerk the club away from the ball on her backswing. You don't hit the ball with the backswing; you hit it with the downswing. You go back slowly, change direction slowly, and then unleash on the downswing. The purpose of the backswing is to get you into a strong position to hit the ball; you develop power on the way down, not on the way up. Note also that her trailing (right) knee stays slightly bent all the way from address to impact. That makes it easier to keep your hips from sliding away from the target on the backswing, which causes a sway; and it keeps you from standing up, which stops you from from coming over the top and hitting it thin. If you're lifting your head, I'd bet good money that you're straightening that trailing knee during your swing. Spend a little time studying the videos and see if you can't pick up a little of the Final Round Queen's consistency. I intend to take another look at Jiyai Shin's swing tomorrow (I thought I'd done it before, but I could only find this one). In the meantime, I found this video she made about a year ago. Problem is, it's in Korean. how she keeps her posture during the swing. It's amazing how much you can pick out just by watching her swing. (Like that beautiful rhythm she has.) I'll pick up on it again tomorrow. With the PGA Tour off this week, it only made sense to do the Summary about the last LPGA / LET major of the year, the Ricoh Women's British Open. But this one had an extra dimension to it, one that made me believe this tournament was more deserving of the Summary than any of the other events being staged. I don't use this word often, but Sunday it certainly fit. Jiyai Shin's play was nothing short of Tiger-esque. And the particular performance I have in mind is Tiger's amazing victory at the 2000 U.S. Open at Pebble Beach. It's not just that Jiyai blitzed the field by 9 strokes in a major. Cristie Kerr did that at a major a couple of years ago, winning by 12 and prompting players to ask if they could play the same course she was playing. And Tiger won at Pebble by 15 strokes. Large wins happen every so often. It's not that Jiyai, like Tiger, was the only player under par when the tournament ended. No, and that's the irony of the term. What makes it so Tiger-esque is something that ISN'T the same. You see, Tiger simply overpowered the course in bad weather. He had shots in his bag during that major that nobody else had even dreamed of yet. In Jiyai Shin's case, she underpowered the course. According to her scoring page, for the week she averaged under 250 yards off the tee... and only 190 yards for the final round! Karrie Webb has won the British Open 3 times, yet her two Sunday rounds were 68-82, compared to Jiyai's 71-73. And in the final round only 2 players scored better -- both Paula Creamer and Lexi Thompson managed par 72s. If anybody has ever exhibited the sheer strength of will that Tiger is known for, Jiyai showed it on Sunday. Perhaps I should coin the term Tigress-esque to describe her. Since Jiyai's last win in 2010 she'd had eye surgery, back problems, and missed two of this year's majors because of wrist surgery. But now, with a T3 and back-to-back wins in her last three starts, it looks like Yani and Stacy just might have a little company in the Rolex Race for #1! Find the fire deep inside?" Grabbed its throat and refused to be ridiculed. The photo came from PGA.com's news page. Isn't it strange that the LPGA doesn't have a picture up yet... and it was their tournament? While watching the second round of the Women's British Open (and listening to much of the commentary during and afterward) I picked up a couple of tips that may help you score better in your next round. One concerned the Kobra, Lydia Ko. Have you noticed how easily she always seems to be swinging, no matter what kind of shot she's playing? She doesn't look like she's swinging any harder when she hits a drive than when she hits a pitch, although she's clearly creating much more clubhead speed with the drive. Andy North mentioned how she seems to be just "letting the game come to her" -- a phrase I've referred to before because it gets used quite often in regard to Lydia. Here's an interesting note in relation to that thought: Of the players in the Top 10, only Vicky Hurst is considered a bomber -- and this despite playing in the wind! Clearly "playing within herself" and "letting the game come to her" hasn't hurt Lydia's play. It's her first time playing an Open and look how well she's doing. And of course, the leader is Jiyai Shin, one of the shortest hitters in the field. Ironically, she doesn't try to hit special low shots to keep them under the wind. Like Tom Watson, she simply plays her normal shots. What caught my attention was somebody (I don't remember who) used the same description of her shots as they use of Tom Watson -- namely, that Jiyai gets a "heavy hit." I've talked about that before -- it simply means that they hit the ball solidly, in the middle of the clubface (in the "sweetspot") time after time after time. I think this is part of "playing within yourself" as well. You tend to mis-hit the ball when you try to swing too hard. Watch both Lydia and Jiyai today and see if you don't see a certain ease in the way they swing the club and hit the ball, even though you know they're putting a lot of effort into it. This is only possible if you can stay fairly relaxed -- or at least not tensed up -- during your swing. And finding the happy medium there is simply a matter of a few minutes in the backyard swinging your club. How fast can you swing without having to tense up at the change of direction? It's not hard to find that level of effort; it's just hard to keep using it when you're out on the course! One last thought -- about the tournament in general, not swing tips -- is that Jiyai is clearly the one to beat but I haven't given up on So Yeon Ryu yet. She's at even (T11), and 9 shots may not be too far behind with 36 holes to play. When she won the 2011 U.S. Open, she opened 74-69 and then shot two 69s in a (nearly continuous) 36-hole run. If Jiyai doesn't come out hot today, several players may yet catch her. Remember, ESPN2 is listing their coverage from 9am until 2pm ET, but Terry Gannon said they were going to cover the tournament to the end. Enjoy! As you probably know by now, the Ladies Golf Union (I inadvertently referred to the R&A in an earlier post -- my boo-boo) cancelled play at the Ricoh on Friday after they realized that even a wet links course is too fast when you've got 60mph winds. Just for the record, I agree with their decision. This isn't about whether you should expect these conditions at an Open or not. It's about whether you intend to make everybody play in those conditions or not. If you send everybody out and the wind changes during the round so the afternoon wave has different conditions than the morning wave, that's the luck of the draw. But if you don't intend to send the afternoon wave out in it, and instead they're going to play the next day in a quarter of the wind, then the officials have artificially influenced the results. So I'm happy with what they decided. In case you didn't hear, the scheduling has changed as a result. The 2nd round will be played today (ESPN2 will still broadcast from 9am until noon ET), then a cut will be made to 50 and ties -- a much smaller cut than normal. Those players will then play 36 holes Sunday, and ESPN2 plans to carry it from 9am until 2pm ET. (That sounds about right to me -- with a 5-hour time difference and daylight giving out around 7pm over there, it sounds like they intend to go live until the end.) With the shorter field and barring any weather problems, that plan should work fine. Royal Liverpool is a fairly flat links, so fatigue really shouldn't be a factor. Will this new arrangement favor any particular player? Opinions vary, but I think it favors my original choice, So Yeon Ryu. This is sounding more and more like the conditions in which she won her U.S. Open, and she's tied for the lead after the first round. But just a little. The wind got up but not as much as expected and some of the holes were set up to play a bit short, so the afternoon wave played less than a stroke higher than the morning wave -- an unexpected turn of events. Still, the winds were tricky; the 2nd shot on the par-4 17th was typically longer than the 2nd shot into either the 16th or 18th -- both par-5s. Short-hitting Morgan Pressel actually hit her 2nd shot over a par-5 green! My prediction that the long hitters might actually be at a disadvantage turned out to be pretty accurate on Day 1. The leaderboard is overwhelmed with short- and medium-length hitters. Ironically, Thursday's round had the highest average score since the Ricoh became a major... and Karrie Webb said it was "the nicest day of the week by far." So Yeon Ryu, -2 (T1): Obviously I'm not surprised. Despite how well she's played this year -- she's #13 in the Rolex Rankings and leading the Rookie of the Year race by a wide margin -- she's still flying under the radar. Lydia Ko, even (T12): It's her first time seeing the course -- her first time in an Open Championship -- and she's doing just fine, thank you. She got to -2 at the turn but fell back (she started on the 10th and the front 9 is harder). Catriona Matthew, +4 (T74): This one's a shocker. A double on the par-5 5th killed an otherwise decent round. She's not out of it by any means -- Ricoh winners have come from as far back as 7 after the first round... but it's still a shocker. Laura Davies, +8 (T125): I said Laura was a flier, and she's certainly looking that way after the first round. But I'm encouraged by the fact that, although she only hit 5 fairways (the rough is horribly thick), she still managed to hit 10 GIR. In addition, she took 36 putts which is her weak spot. Just a decent putting round would have kept her fairly close. If she gets hot in Friday's round, she's still not out of this... expecially since more wind is expected today. That may hold the lead where it is or even drop it a bit. Yani posted at even, along with Cristie Kerr, Inbee Park, Morgan Pressel, and Beatriz Recari, among others. Karrie Webb, Jiyai Shin, and both Miyazatos all got in at -1. Michelle Wie managed +3 (T55), a better position than some of the favorites like Suzann Pettersen, Lindsey Wright, and Mel Reid. And 4 amateurs are in at +1 or better, led by Charley Hull at -1. BTW, there was a change in the broadcast schedule. It'll be on ESPN2, not ESPN, this morning from 9am ET until noon. If they do it the way they did Thursday, there'll be one hour of tape-delayed play from the morning wave followed by two hours of live golf. Let me say upfront that I like Yani Tseng's attitude coming into this week. I haven't picked her, but I think she's in the right frame of mind to possibly defend her title again. I'm also going against the reigning opinion that the big hitters have the real advantage this week. With so much wind and the course so wet, I think the long hitters may actually be at a disadvantage. If they're too confident that their strength is an advantage, they may actually try to do too much and end up hurting their chances. So Yeon Ryu: I mentioned her as my favorite in yesterday's post, and I still think she'll play well. Just remember how well she played at that wet, dragged-out U.S. Open that she won back in 2011. Lydia Ko: I don't care if she is an amateur, the Kobra is playing extremely well on a limited schedule. With one major (the U.S. Women's Am is a major for amateurs, after all) and two other worldwide wins -- and she's gotten two of those three within the last month or so -- you have to figure she's at least got a chance. And again, that Canadian Open course where she won was wet also. Paula Creamer: I think the key for Paula is her putter, and she's coming off her first hot putting week in a while. The lack of time to rest may actually help her keep that streak going, and she's got something to prove after coming so close last week. Catriona Matthew: I mentioned in yesterday's post that Tony Jesselli had ranked her first on his list of best chances. She's not a long hitter, but she's won this tournament before (2009) and -- excuse me for stating an obvious, perhaps cliche strength -- she's from Scotland. She's used to this kind of weather! Laura Davies: I admit I'm taking a flier on this one, but for some reason I have a good feeling about Laura this week. With all of her experience she won't be shaken by the tough conditions, and I believe the slower wet greens will help her sometimes streaky putter. While she may not be high on the list of possible winners, I certainly won't be surprised if she wins and finally punches her ticket into the Hall of Fame. So there they are, my "5 to Watch" this week. Remember that the broadcast starts this morning on ESPN from 9am ET until noon. Because of the early TV times tomorrow, I'm previewing the Ricoh Women's British Open today. This year the Ricoh is being played at Royal Liverpool, in Hoylake, the course where Tiger won his 3rd Open Championship back in 2006. I'm glad the women are getting to play the same courses as the men now, even if the R&A sometimes sets them up a bit too soft. In fact, the course's site says that the course will duplicate the routing used in 2006, with players teeing off on the 17th hole (which has a new greens complex) and finishing up on the 16th. Apparently this is a logistics move, as the site indicates that 16 is where the grandstands and clubhouse are best situated. The course will play 6660 yards -- fairly long for a ladies tournament -- and Yani Tseng will be attempting to make her 2nd defense of the title. (She won in both 2010 and 2011.) However, since she hasn't quite been on her game the last few months, it'll be interesting to see what happens. We know that both Jiyai Shin (the 2008 winner, when she beat Yani to do it) and Paula Creamer are playing well, as are Stacy Lewis, "the Kobra" aka amateur Lydia Ko, both Miyazatos, Shanshan Feng, and Na Yeon Choi, just to name a few. Tony Jesselli has a preview over at Mostly Harmless that you might want to check out. Tony's picking Catriona Matthew as his favorite this week -- always a good pick, as Catriona won in 2009. I haven't really made choices yet, but my gut reaction is to take So Yeon Ryu as my fave (Tony has her #12). It's also hard for me not to think the Kobra's a good pick, amateur or not, and Paula Creamer. I think Paula's got something to prove this week and if her putting holds up, she could do it. And most important, you need to remember that ESPN is carrying the tournament all 4 days, from 9am ET until noon. This is the last of the ladies' majors this year, and the PGA is on a break, so you don't want to miss this one! With a wedge, of course! I was looking for some video on how to use a 64-degree X-wedge. Fortunately I found this footage from a UK site where Phil demonstrates not only how to hit a flop shot with a 60-degree OR HIGHER wedge, but he also shows how to adjust your swing for a tight lie or for one with more grass under the ball. I may do another post using this video later, but this is such a simple and well-explained clip -- with extremely simple technique -- that I'm not going to comment on it today. I'll just say that this is one of the best instructional clips I have ever seen from Phil. This should really help you learn how to adjust for different types of lies, which is the hardest part of a flop shot. But note that even Phil says this isn't a high-percentage shot. You'll need to practice it if you want to have any confidence in it. Enjoy! Around the wider world of golf: The LPGA still doesn't have a winner at the Kingsmill Championship! Paula Creamer and Jiyai Shin played 8 playoff holes before they could no longer see the fairway. GC will broadcast the continuing playoff this morning at 9am ET. Elsewhere, Peter Hanson won the KLM Open on the ET with an eagle on the 18th hole; Caroline Hedwall successfully defended her UNIQA Ladies Golf Open title on the LET; Matthew Griffin won the High1 Resort Open on the OneAsian Tour; Terry Price won the Pon Senior Open on the Euro Seniors Tour; and apparently Chie Arimura won the JLPGA's 2nd major of the year, the Konica Minolta Cup. I imagine the Constructivist will have a summary up soon. Before I go any further, let me repeat what I said earlier: The LPGA still doesn't have a winner at the Kingsmill Championship. Paula Creamer and Jiyai Shin played 8 playoff holes before they could no longer see the fairway. GC will broadcast the continuing playoff this morning at 9am ET. I want to make sure you know about that, in case you read this in time to see it! UPDATE: Jiyai Shin won on the first hole Monday morning (which would be the 9th playoff hole) with a par. If you saw the final round, you know that the 2012 golf season somehow keeps getting better and better. Just when we think we've seen the best golf we've ever seen, BAM! We get something even better. And it's fair to say that we've never seen ANYTHING like we saw this weekend. In the end, we got Rory winning his 2nd tourney in a row and his 3rd in 4 starts. In the process he pretty much locked up the money title and POY, and possibly both of the scoring titles. We saw ALL of the golf world's heavyweights going toe-to-toe on a tough course all at once. And we ended up with a Tour Championship field of 30 that may very well be the best single field ever assembled. It would have been nice to see Lee Westwood in that group, but it's not bad, is it? And -- once again -- Tiger and Rory will be paired for the first two days of the Tour Championship. With Mickelson busting into the Top 5, the Tour and sponsors got just about everything they could have possibly asked for. Like I said, we've never seen ANYTHING like we saw this weekend... at least, not until the Tour Championship in a couple of weeks. Until then, at least we've got the Ricoh Women's British Open to keep us entertained. Need I remind you that the Kobra will be there? In the points. Now he's MORE than a headache! The photo came from the BMW Championship home page at PGATOUR.com. It's the only possible word to describe the atmosphere around PGA Tour headquarters and the FedEx home office Saturday night. We all know they planned the FedExCup Playoffs with this in mind. Nevertheless, does anybody really expect me to believe that the powers-that-be, even in their most fevered hallucinations, ever expected this? Tied for the lead you've got Phil Mickelson and Vijay Singh, members of the "older generation" with 7 majors between them and who'd been pretty much written off this year. So what does Phil do? Post a little 64, that's all -- the lowest round of the day by 2 strokes. One stroke back you've got Rory McIlroy and Lee Westwood, #1 and #4 in the OWGR, with Rory coming off a major and a FedExCup win just last week. Two strokes back you've got Adam Scott, Robert Garrigus, and Dustin Johnson -- the "Heartbreak Kid" of the Open Championship and two of the longest young guns on Tour. Three strokes back is Tiger Woods. Need I say more than just "Tiger"? And four strokes back you've got Zach Johnson, Graeme McDowell -- each with a major -- and Bo Van Pelt, who's making a case that he should have been picked for the Ryder Cup team. In fact, 7 of these players are playing in the Ryder Cup in just a couple of weeks. We all know how much anticipation that's stirred up! But that's not all. You've also got more big names lining up behind them, they're playing a course best-known for an upset major win by an unknown named John Daly, and the course is so soft that any score more than -3 is going to lose ground. It's gonna be a great shootout today, but I just hope the big wigs get to see it. With all the drinking and celebrating that went on in those offices Saturday night, most of them are probably still trying to make bail after the police busted 'em for disturbing the peace. The photo came from the Let's Talk Wine website. But I'm not. Sad as a retirement is, that's not what I'm talking about. And I could be wrong about this... but I don't think I am. So I want to mention it before it (probably) becomes final on Monday. For 438 weeks Cristie Kerr has been in the Top 10 of the Rolex Rankings. That's over 8 years, and it's quite an accomplishment. But Cristie's struggles over the last few months finally dropped her down to #10 last week... and she too missed the cut at Kingsmill Friday. Cristie's point average is 6.01 on the current ranking. Mika Miyazato is #11, a mere .07 points behind; she's T15 after the second round. And Jiyai Shin is #13, .6 points behind... and she's leading the tournament. It doesn't look good for the current #10. I have felt for a long time that Cristie was the best American player among the women. She's been a little uneven at times -- most players are -- but she just kept coming back. And that 438-week run in the Top 10 was the proof. But I think -- and most folks agree -- Cristie is just getting in her own way right now. She's pressing, trying to get back in the winner's circle. Although the LPGA is slowly recovering from its economic problems, the schedule still isn't full enough to allow players to develop a rhythm of play... and I think that's affected her more than most. Stacy Lewis is the unquestioned top American right now. I don't know how long it will last -- even Stacy's had a few struggles this year, and most of the LPGA players seem to be struggling with the lack of playing time -- but Stacy's definitely putting up the necessary numbers for now. And I see no reason to believe she won't play well going forward. I suspect Cristie will rebound from her mini-slump and re-enter the Rolex Top 10 eventually. But it looks like the record will probably end this week. It's just another example of the changing of the guard we seem to be seeing in the world of golf across all the tours and around the world. It was a good run, Cristie. Maybe now it's time to relax a bit and -- I hate platitudes like this, but in this case I think it's accurate -- "just let the game come to you." You really can't hold on to this game too tightly; a tense grip will kill your game faster than almost anything. And given that your putting seems to be suffering most right now, that sure sounds like the source of the problem. Take a tip from Rory: Try to start enjoying yourself out on the course again. It certainly worked for him. It appears that rain is the newest technology for lowering golf scores. It doesn't matter whether you're a long hitter or a short hitter. In many cases, it doesn't seem to matter whether you're accurate or not. All you need is a wet course and WHAMMO! Instant low scores. At the BMW Championship, 55 of the 70 players shot under par after a little rain was added to the course, and 4 players posted 64 (-8). Playing lift, clean, and place (LC&P) allowed the mighty Crooked Stick -- a course officially "Daly-proofed" after John Daly brought it to its knees back in 1991 -- to become a pitch-and-putt. Clearly the USGA will have to do something about this in order to preserve the integrity of the game. This is clearly a much bigger threat than belly putters, as players have absolutely no choice about whether to play wet courses or not! Unless the USGA is willing to mandate domes over all the courses, thus giving them the ability to limit the amount of rain that falls on the course, the equipment will simply have to be changed. Since the problem is that balls stop more quickly on wet greens -- and since the USGA has made it clear that they don't want to "roll back" the ball specs -- the most obvious solution is to alter the grooves. This is a solution that the USGA has proven more than willing to enforce, no matter what kinds of other problems it may cause. This willingness on their part makes the solution really simple. All they have to do is eliminate grooves entirely. Not only will all the shorter courses become relevant again (because the players won't be able to hit those greens any better than the longer courses), but it will make equipment much easier to evaluate. Does it have grooves? It's illegal. Is the face smooth? It's legal. How much simpler could you want it? Oh, and there's one last thing they should do. This is an excellent place to institute bifurcation -- you know, two sets of rules, one for pros and one for amateurs. Of course, once amateurs are able to play better than the pros, the game will cease to be interesting and will therefore lose its audience. But that isn't important. After all, the only thing that matters is the integrity of the game, right? And if we want to do that, we have to eliminate the effects of rain from the game. It's just a matter of time. The Michelob Ultra Open at Kingsmill was one of the LPGA's most popular events until it vanished during Carolyn Bivens's tenure as commissioner. Several tournaments were lost during the economic struggles of that time, but it's probably unfair to attribute the loss to her. Anheuser-Busch (Kingsmill's owner at the time) was sold to a European brewer called InBev, and they simply decided to put their money elsewhere. Now in the hands of Xanterra Parks and Resorts -- and perhaps also because Whan is now at the helm of the LPGA -- Kingsmill is back on the schedule as the Kingsmill Championship. The 2012 incarnation is being played this week; next year it will be moved to a date in May. It took me a little effort to confirm who the new sponsor was. If you want more details, here's the Richmond Times-Dispatch article I found from back in January when the deal was done. There's some good info there. The River Course is located in Williamsburg, Virginia. The overall purse has taken a hit -- dropped from $2.2M in 2009 to $1.3M this year -- but I suspect that may improve if the tournament regains its popularity. Bear in mind that Xanterra is owned by the same company that owns The Broadmoor in Colorado Springs, where the LPGA held the 2010 U.S. Women's Open (that info also came from the article mentioned earlier), so that bodes well for the future of the event. The article said that, although the initial deal is just for two years, that "both parties [the LPGA and Kingsmill] 'fully intend for Kingsmill to be on the schedule for a long time to come.'" The 2009 winner was Cristie Kerr, and Tony Jesselli noted over at Mostly Harmless that this is a fairly weak field since most of the non-American players aren't there. (That's no reflection on the tournament, btw. The Ricoh Women's British Open is next week!) That means, in all likelihood, that we will see an American winner this week. Or maybe not. One of the more notable entrants this week is Marcela Leon, the winner of Big Break: Atlantis. A sponsor's exemption into the Kingsmill was one of her prizes. Next week she heads back to the Symetra Tour... unless maybe she pulls out a win? You can read an interview with her at this LPGA news page. I think that pretty much covers everything you need to know. You can check Tony's preview of the tournament at the Mostly Harmless link mentioned earlier. I'll just remind you that we get LIVE coverage this week, from 12:30pm to 2:30pm ET today on GC. The leaderboard was laden with big names playing well. That's the key thing. While Rory and Louis were the two most likely winners, stumbles by both in the last 4 or 5 holes, combined with a solid round by Tiger, actually gave him a chance to come from 6 back and post an upset win. In the end, Rory posted -4, Louis even, and Tiger -5 for the final round. Here's my logic: Stricks teams well with Tiger and putts well. Sneds is clearly in the best form of any of the choices... and he also putts well. DJ is the "hot player" who played his way onto the team; he has length, a vastly improved short game, and pairs well with both Phil and Tiger. I think these three are as close to locks as you're going to find. At any rate, GC will carry the announcement press conference at 10am ET this morning. Does it seem as if I'm glossing over this tournament? I don't mean to. It's just that there was too much going on to really write an adequate summary. I really do feel that the leaderboard tells it all: Tiger and Phil finally getting it in gear over "the weekend," such as it was, being that we had a Monday finish; Rory continuing to find a way to post scores despite still not playing quite as well as he did earlier in the year; and the other big names we expect to be in contention finally starting to rise to the challenge. That's the legacy of Deutsche Bank this year... and it's a good one. Was struggling to post a good score. You! Clearly he struggles no more. The photo came from the tournament home page at PGATOUR.com. Since the Limerick Summary is delayed a day by the Monday finish at Deutsche Bank, I thought I'd pull out a few swing tidbits from Sunday's round that some of you might find helpful. Tiger's Fade: You may have heard (yet again) some of the commentators who are a bit concerned about Tiger's fade. Not just that he's playing a fade most of the time, but that he's aiming so far left all the time. That means he's playing from a very open stance. Having watched it for a while -- and watching Tiger's progress with his swing -- I'm pretty sure now that his stance is less about the shot shape and more about his left knee. It's possible to play a fade without opening your stance a whole lot, but by opening his stance so much he takes a lot of the twisting stress off of his lead knee. It lets him turn his hips very fast without straining it so much. Rory's "Heavy Hit": When they say Rory has a "heavy hit" they simply mean that he hits the ball right in the middle of the clubface every time, with the clubface square. That's just a matter of good balance and rhythm... and a little practice. The steadier you are during your swing, the easier it is to hit the ball solidly and therefore the "heavier" you can hit it. Dufner's Short Backswing: Johnny Miller was joking that Jason Dufner may have the shortest backswing on Tour. However, if you check his stats, you'll find he's "average" length just like most of the other golfers out there. How does he do it? The shorter backswing (which I've mentioned several times and made it a focal point of this post) is very lever-oriented. His right elbow stays extremely close to his side during his backswing, and he makes serious use of the "swoosh" as a result (check The Swoosh at the Bottom: The Power Move That Adds Distance series on The Route 67 Posts page). The shorter backswing also makes it easier for him to keep his balance and get a "heavy hit" of his own. Louis and Rory's Long Swings: Just the opposite of Dufner, Rory and Oosthuizen are both very flexible and allow their swings to be long. But unlike Dufner, who's shorter swing is more lever-oriented, their swings are very rhythm-oriented. They have to make sure they have plenty of time for the backswing to finish and change direction. If you watch them carefully, you'll see that Jason has a very quick change of direction while Rory and Louis look much more leisurely and relaxed. Otherwise, Louis and Rory would lose their balance and mis-hit too many shots. So there are a few quick tips that may help you improve your game. I'm always looking for new ways to describe old problems. Generally, we all have the same handful of problems, over and over, but we do them in slightly different ways. Today we're looking at what happens you come over-the-top, but from another angle. Some players, even if they use a one-piece takeaway, can still find themselves locking their trailing leg and hip. For some, this is just poor footwork; for others, a sway; or maybe even some other problem. At any rate, locking your trailing side causes you to pivot around your trailing hip joint instead of your spine. 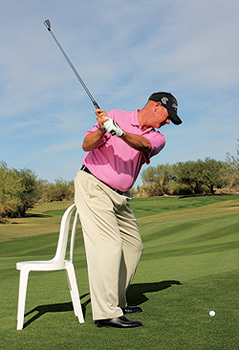 I found this quick tip at golftipsmag.com called Take a Seat. You can read the tip to see how it works; I want to focus on the problem it's intended to help you solve. If your lower body isn't in the correct position at the start of your downswing, the left side of your backside will make contact with the chair prematurely. Let me explain why this happens. When you lock your trailing side, you can't shift your weight forward as you start your downswing. Instead, your lead hip (your left hip if you're a right-hander) will immediately swing back away from the ball. That makes your lead hip move backward too much while your trailing hip doesn't move toward the ball at all. To put it another way, since your trailing knee is straight, it just acts like a post stuck in the ground. When your trailing side locks, it pushes your trailing shoulder up too high. Then, when you start down, your trailing shoulder twists forward, over the ball, and your lead hip twists backward too soon. The result is that your downswing plane is changed from straight toward the target to a pulled shot. Now, if you try the drill in this tip and you find that your trailing hip is locked, the simplest way to fix it is to make sure your trailing knee stays slightly bent all the way through your swing. If you don't straighten your knee, it won't lock. If your knee don't lock, your hip won't lock. If your hip don't lock, it won't push your shoulder up too high. And if none of that happens, you're much less likely to make an over-the-top downswing. Keeping that trailing knee flexed is one of those key points in your swing that, if you do it, it takes care of a whole load of other things automatically. Just making sure you have a one-piece takeaway and a flexed trailing knee during your swing can work miracles. Oh yeah... and if you've ever heard teachers talk about "firing your right side" (for right-handers, that is), keeping that trailing knee flexed is the primary key to that move as well. You can't fire a gun with the safety on (a safety is just a lock), and you can't "fire your trailing side" if it's locked in place. It's Labor Day weekend here in the US and, while there aren't a lot of tournaments going on, the ones that are certainly have the potential to deliver some great stories. On the ET at the Omega European Masters -- one of the bigger tournaments -- I mentioned Paul Lawrie's chance to go back-to-back after winning last week's Johnnie Walker Championship. (For the record I define "big" on the ET as a purse of €2,000,000 or more, and the Omega is €2,100,000.) I forgot to mention that this would be Lawrie's 3rd win of the season, as he also won the Commercialbank Qatar Masters back in February. (Qatar is just under that €2,000,000 mark.) As things stand right now, Lawrie is just 2 strokes off the lead after 36 holes. But an equally good story there is Julien Quesne, a French player who got his first ET win earlier this year at the Open de Andalucía Costa del Sol back in March. Quesne leads the tournament at -9, and weather has become a factor there... which I believe will favor Lawrie. If you haven't been keeping up with the tournament, you definitely should peek in on it. On the Web.com Tour, Ben Kohles -- one of the potential "battlefield promotion" players -- had a rough 2nd round and ended up 8 strokes back after 36 holes. However, Casey Wittenberg (the other potential BPer, who also happens to be a good friend of LPGA player Paula Creamer) is just 2 shots off the lead set by Brad Fritsch. Fritsch has had a rough season -- only 3 Top10s and 6 missed cuts -- but he's playing some awesome golf this week with rounds of 66-64. That one could also get very interesting. And then there's the Deusche Bank -- only 18 holes at this point because Labor Day allows a Monday finish -- with Tiger posting one of his best rounds of the year (-7) along with Jeff Overton, who's been struggling most of this year. The breeze came up in the afternoon and the general consensus was that those rounds would hold up. WRONG! Not only did Ryan Moore match that -7 in the afternoon, but Chris Kirk (who's also struggled this year) posted -8. However, I have to toot my own horn a bit. Remember yesterday when I said Seung-Yul Noh remained on my "Players to Watch" list and that we shouldn't write him off yet? He took the lead with a bogey-free -9 during the afternoon! Add Rory, Oosthuizen, Poults, DJ, Luke, and Dufner -- all in the Top 10 -- to the mix, and this could end up being a shootout come Monday. In case you don't live in the US, Labor Day weekend usually ends up being filled with cookouts and other get-togethers. That's the reason for this little breakdown. Hopefully it will help all our partygoers make sure they don't miss any of the players that interest them!